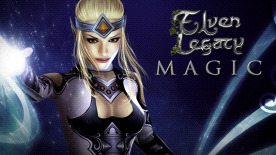 The era of Elven Legacy is coming to an end. The relentless wave of demonic magical energy triggered by the death of the demon Farrakh has swept the world and has now reached the free city of Sylent. Powerless, the Masters of the Academy of Magic are being driven insane. The Holy Inquisition, inspired by the clerics of the kingdom of New Tixus, acts swiftly to intervene in the seemingly hopeless cause of preventing the world’s slide into darkness and madness.